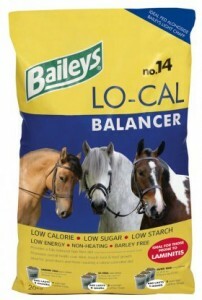 Lo-Cal balancer is a nutrient dense pellet containing all a horse or pony needs for health and well being but with a minimal carbohydrate (calorie) content. Its quality protein provides the essential amino acids required to build and repair muscle and other tissues whilst Yea-Sacc® stimulates fibre digesting bacteria, helping to improve gut efficiency. The superior vitamin and mineral content promotes good health and supports performance and includes chelated (Bioplex®) minerals which are more easily absorbed and utilised by the horse’s body. Fed by the mug-full, Lo-Cal balancer can be given as the sole concentrate, providing those nutrients lacking in forage, and mixed with a little light chaff, if desired, to give good-doers a bit more to chew on. Its low starch (under 10%) and calorie content also make it ideal for those prone to laminitis and it contains excellent levels of biotin, methionine, calcium and zinc to promote healthy hoof growth and repair. For those receiving reduced levels of other compound feeds, Lo-Cal can be added to top up nutrient levels and maintain a balanced diet.